I am pretty excited to be posting this favourites post while it's still actually April! Yay for timely posts. This month has been minimal makeup again. The minimal makeup thing appears to be a bit of a recurring theme at the moment for me. I kept eyes really simple, using Burberry's Pale Barley Eyeshadow all over the lid. Pale Barley is a gorgeously sheer medium brown that's a little taupey, with a golden sheen. I have fallen for Hakuhodo brushes and the Hakuhodo J5523 is the most outrageously soft multi tasking brush for eyes. 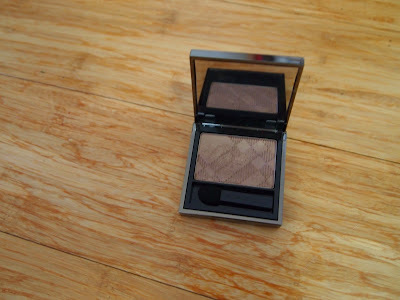 I use it for applying shadow all over the lid or blending. I hear it's a softer, cheaper, better dupe for the MAC 217. My favourite mascara is by YSL and I'm pretty sure that L'Oreal Voluminous is a very close dupe and was an affordable add-on from a recent amazon order. I use the black-brown shade because I find it flattering for everyday and easy to wash off. Due to me getting enough sleep for once in my life, I'm steering clear of under eye concealer and just using the infamous YSL Touche Eclat (in shade 2, if you were interested) to provide a little bit of camouflage and highlight. The weather has cooled down and my skin has become a little dry. To keep my face fresh, I adore the herbal scent of Caudalie's Beauty Elixir. It's great to spritz on a fresh face or over makeup. 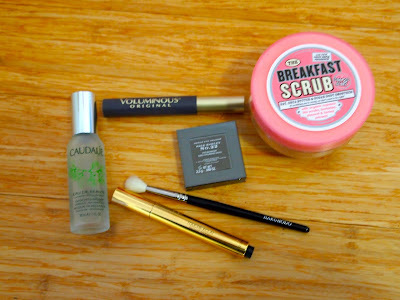 In the mornings I love to use The Breakfast Scrub from Soap & Glory. It's an amazing, hydrating, sugar based scrub that smells just like pancakes with maple syrup. Who could ask for more? ... And no calories. The Breakfast Scrub sounds amazing. I will definitely check it out the next time I go into the city. I really really want to try pale barely, it's absolutely stunning!